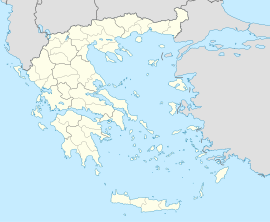 Komotini (Greek: Κομοτηνή; Turkish: Gümülcine) is a city in the region of East Macedonia and Thrace, northeastern Greece. It is the capital of the Rhodope regional unit. It was the administrative centre of the Rhodope-Evros super-prefecture until its abolition in 2010, by the Kallikratis Plan. The city is home to the Democritus University of Thrace, founded in 1973. Komotini is home to a sizeable Turkish-speaking Muslim minority. Built at the northern part of the plain bearing the same name, Komotini is one of the main administrative, financial and cultural centers of northeastern Greece and also a major agricultural and breeding center of the area. It is also a significant transport interchange, located 795 km NE of Athens and 281 km NE of Thessaloniki. The presence of the Democritus University makes Komotini the home of thousands of Greek and international students and this, combined with an eclectic mix of Western and Oriental elements in the city's daily life, have made it an increasingly attractive tourist destination. The city stands at an altitude of 32-38m on the Thracian plain near the foothills of the Rhodope Mountains. It is situated between two rivers, Boklutzas on the west and Trelohimaros on the east (which form, alongside the Karidia stream, the river Bosbozis). There is little urban planning in the older parts of city, in contrast to more recently developed quarters. According to the 2011 census, the municipality's population amounts to 66,919, a number that does not include approximately 12,000 resident students, trainees and soldiers. There are two airports near Komotini. The nearest is in Alexandroupoli (65 km), and the other is in Kavala (80 km). It has rail and bus links to all continental Greek cities as well as Istanbul, and the good provincial road network has been supplemented by the new Egnatia Odos motorway. Source: <World Weather Online= > "Komotini Monthly Climate Averages". Komotini Monthly Climate Average, Greece. World Weather Online. 2016. Retrieved 13 September 2016. Komotini has existed as a settlement since the 2nd century AD. That is confirmed by archaeological finds of that era up until the 4th century. It is also confirmed by an inscription on the ruins of the 4th-century Byzantine wall, that are visible at various sites in the city, which reads "Theodosiou Ktisma" = Building of Theodosius. The inscription was discovered by the Komotini-born Prof. Stilponas Kyriakidis and the then mayor Sofoklis Komninos. It is said that the settlement originates from the 5th century and is linked to the daughter of the painter Parrasios from Maroneia. During the Roman age it was one of several fortresses along the Via Egnatia highway which existed in the Thrace area. Probably it is to be identified with the Roman station Breierophara (a Thracian toponym from bre (=fortress) + iero (= holy) + phara=para (=pass). The most important city of that period was neighbouring Maximianopolis, former Thracian Porsulis or Paesoulae, which was renamed to Mosynopolis in the 9th century. Komotini was a Via Egnatia hub on its northern route through the Nymphaea Pass which led to the Ardas Valley, Philippopolis (modern Plovdiv) and Byzantine Berroe (modern Stara Zagora). The city's history is closely connected with that of Via Egnatia, the Roman trunk road which connected Dyrrhachium with Constantinople. The Roman emperor Theodosius I built a small rectilinear fortress on the road at a junction with a route leading north across the Rhodope Mountains toward Philippopolis. During the Byzantine period, the city belonged to the Theme of Macedonia, whilst from the 11th century it could be found within the newly founded theme of Boleron. For most of its early existence the settlement was overshadowed by the larger town of Mosynopolis to the west, and by the end of the 12th century, the place had been completely abandoned. The current settlement dates to 1207, when, following the destruction of Mosynopolis by the Bulgarian tsar Kaloyan, the remnant population fled and established themselves within the walls of the abandoned fortress. Since then the population had been increasing continuously until it became an important town within the area. In 1331 John Kantakouzenos referred to her as Koumoutzina in his account of the Byzantine civil war of 1321–1328. In 1332 Andronikos III Palaiologos set camp in Komotini to face Umur Bey of Smyrna at the Panagia village close to the Panagia Vathirryakos (Fatirgiaka) monastery. However, Umur departed without a battle. In 1341 the historian Nikephoros Phokas referred to the town with its current name. In 1343, during the civil war between John VI Kantakouzenos and John V Palaiologos, Komotini along with the neighbouring forts of Asomatos, Paradimi, Kranovouni and Stylario joined Kantakouzenos' side. John VI Kantakouzenos escaped to Komotini to survive from a battle with the army of the Bulgarian brigand Momchil near the already ruined Mosynopolis. The city was captured by the Ottoman Empire between 1361 and 1362/3, apparently by Gazi Evrenos Bey. Its conquest is placed after the fall of Philippopolis and Stara Zagora, but before the Ottoman capture of Pegae. Already before that, it was called in Turkish as Gümülcine, a version of the demotic Greek form of the city's name, Koumoutsinas. This remained the city's name throughout the Ottoman period (ca. 1361–1912) and continues as its modern Turkish-language name today. The city continued to be an important hub connecting the capital city of Constantinople with the European part of the Empire, and grew accordingly. Many monuments in the city today date to this era. Many local families fled at that time to Epirus and founded the Koumoutzades village (modern Ammotopos, Arta). Even there they were persecuted and some of them found refuge in Tropaia of Gortynia. The bond between the inhabitants of Komotini, Ammotopos and Tropaia exists to this day. In the first two decades after its conquest, until 1383, the city was the seat of a frontier march (uç) under Evrenos, confronting the Serbian territories of Macedonia. The walled city continued to be inhabited by Greek Christians, but Evrenos brought in Turkish settlers to the countryside around the town. From the prevailingly Turkish toponymy of the area, it appears that the region was largely deserted, and subsequent Ottoman censuses show that Muslim Turks quickly became the dominant element in the rural districts around the city. Evrenos also built a masjid (small mosque), an imaret, bath, and shops outside the city walls, establishing a waqf that according to Machiel Kiel became the "nucleus of Islamic life in Western Thrace". The 16th-century geographer Mehmed-i Ashik also mentions a hostel (imaret) built by Evrenos. In the 1519 census, the city numbered 393 Muslim households and 197 single (unmarried or widowed) Muslims, 42 Christian households and 14 single Christians, and 19 Jewish households and 5 single Jews, in total ca. 2,500 people. In the 1530 census, the 17 Turkish-named neighbourhoods (mahalle) are mentioned, as well as the existence of one Friday mosque, 16 masjids, 4 zawiyas, 4 schools, and a single church (in the walled city). Nevertheless, the French traveller Pierre Bellon du Mans, who visited the city in 1548, stated that "the city is inhabited by Greeks and a few Turks". In the 1600s, the town was graced by new buildings—a small Friday mosque, a double bath, a mekteb, a madrasah, and an imaret—by the defterdar Ekmekcizade Ahmed Pasha, who sponsored numerous such works throughout Thrace. Ahmed's mosque, the Yeni Mosque, which survives to this day, is the only structure in Greece to feature Iznik tiles from the 1580s, the zenith of the Iznik potters' art. When the traveller Evliya Çelebi visited the town in 1667/8, he found "4,000 prosperous, stone-built houses"—likely an exaggeration—in 16 mahalles, with 5 main mosques, 11 masjids, 2 imarets, 2 baths, 5 madrasahs, 7 mektebs, 17 caravanserais, and 400 shops. The town suffered greatly from repeated plague epidemics, which led to entire villages being abandoned, but recovered in the 19th century. During the Greek War of Independence Komotini's inhabitants contributed substantially with Ioannikios (later bishop), Aggelis Kirzalis and Captain Stavros Kobenos (members of the Filiki Eteria organisation). During the following decades Komotini progressed financially due to the processing and trade of tobacco. Greeks took advantage of the religious liberty granted by the Ottomans and completely controlled the economic activity of the city. The 19th century saw the city expand and considerable architectural activity, with the renovation of old and the construction of new buildings. 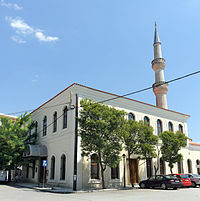 Both the Yeni Mosque and Evrenos' original masjid, the Eski Mosque, were enlarged by the addition of spacious prayer halls, while Sultan Abdulhamid II erected a clock tower and a madrasah. During his reign, the town became a station in the railway linking Constantinople with Salonica. By the 1880s, the city, capital of the homonymous sanjak in the Edirne Vilayet, boasted 13,560 inhabitants, 10 Friday mosques, 15 masjids, 2 Greek and one Armenian church, a synagogue, 4 madrasahs, two higher schools, ten mektebs, and various other Christian and Jewish schools. After the Russo-Turkish War of 1877–1878, a new wave of Muslim refugees arrived in Komotini. During that period the area found itself under Bulgarian self-awareness which originated in the rise of Bulgarian nationalism. In 1880 a Girls School and a Boys Urban School were functioning. In 1885 the cultural association 'Omonoia' was founded and it contributed in the cultural life of the city by presenting theatrical plays and concerts. Great benefactors such as Nestor Tsanaklis (builder of the Tsanakleios School, Dimitrios Sintos et al.) rose during that era. Remarkable people that were born in Komotini include Alexandros Symeonidis (Professor of Medicine at the Aristotle University of Thessaloniki) and Victoria Margaritopoulou (one of the first Greek female doctors). Stamp issued by the Greek military administration during the Second Balkan War (1913). The Greek mission in Komotini after the incorporation of the area, 1920. During the First Balkan War, Bulgarian forces captured the city, only to surrender it to the Greek army during the Second Balkan War on July 14, 1913. In the aftermath of the Second Balkan War, it became briefly the capital of the short-lived Provisional Government of Western Thrace, but the Treaty of Bucharest, however, handed the city back to Bulgaria. The city was part of Bulgaria until the end of World War I. During this period, the city had the Bulgarian name Гюмюрджина Gyumyurdžina. In 1919, in the Treaty of Neuilly, Komotini was handed to Greece, along with the rest of Western Thrace. The population is quite multilingual for a city of its size and it is made up of local Greeks, Greek refugees from Asia Minor and East Thrace, Muslims of Turkish, Pomak and Romani origins, descendants of refugees who survived the Armenian Genocide, and Pontic Greeks from north-eastern Anatolia and the regions of the former Soviet Union (mainly Georgia, Armenia, Russia and Kazakhstan). The Muslim population of East Macedonia and Thrace dates to the Ottoman period, and unlike the Muslims of Macedonia and Epirus, was exempted from the 1922-23 Greek-Turkish population exchange following the Treaty of Lausanne. View of a central street. Komotini is, nowadays, a thriving commercial and administrative centre. It is heavily centralised with the majority of commerce and services based around the historical core of the city. Getting around on foot is therefore very practical. However, traffic can be remarkably heavy due to the daily commute. In the past, the Trelohimaros river used to flow through the city and divide it into two parts. In the 1970s, after repeated flooding episodes the river was eventually diverted and flows on the east of the city, while its former bed has been replaced by the main avenues of the city (like the Orfeos Street). At the heart of the city lie the evergreen Municipal Central Park and the 15 m-high WW2 Heroes' Memorial, locally known as 'The Sword'. The revamped Central square or Plateia Irinis (Square of Peace) is the focus of a vibrant nightlife boosted by the huge number of students living in the city. The Old commercial centre is very popular with tourists as it houses traditional shops and workshops that have long vanished from other Greek cities. In addition, in the northwestern outskirts of the city (Nea Mosinoupoli) locals and tourists alike flock into a modern shopping plaza: Kosmopolis Park, which houses department stores, shops, supermarkets, a cinema complex, cafés and restaurants. The area stretching from Kosmopolis to Ifaistos is gradually becoming a retail destination in its own right. Komotini began life as a Byzantine Fortress built by the Emperor Theodosius in the 4th century AD. The ruins of this quadrangular structure can still be found NW of the central square. Komotini has several museums including the Archaeological, Byzantine and Folklore museums. SW of the central square one can find the Open-air Municipal Theatre, which hosts many cultural shows and events such as the cultural summer (πολιτιστικό καλοκαίρι = politistiko kalokairi). There is a Regional Theatre (DIPETHE) whose company produces many plays all year round. 6 kilometres (4 miles) NE of Komotini is the Nymfaia forest. It has recreational facilities which comprise trails, courts, playgrounds and space for environmental studies. The forest is divided by a paved road which leads to the ruins of yet another Byzantine fortress and the historical (WWII) fort of Nymfaia. The monument for the Holocaust. Writings in the area of ancient Maroneia confirm the presence of Jews in the area. In the 16th century the Jewish community of Komotini consisted of Sephardite Jews who were textile and wool merchants. Many of the Jews had come to Komotini as immigrants from Edirne and Thessaloniki. The community was concentrated within the ancient walls of the city where the Synagogue was built in the 18th century. It was destroyed during WWII. In 1900 there were 1,200 Jews. In 1910 the Alliance Israelite Universelle School started functioning. Greek, French and Hebrew were taught in the school. In 1912–13 many Jews moved to larger cities such as Thessaloniki and Istanbul. After the liberation of Komotini (May 1920) the Israelite community of Komotini had a Cultural Club and Charity organisations. During the Bulgarian administration, the Bulgarians (Nazi allies) arrested 863  Jews and sent them to the concentration camp of Treblinka where they were exterminated (28 survived the Holocaust). In 1958 the Israelite community was dissolved due to lack of members. In 2004 the municipality of Komotini created a memorial (southern entrance of Central Park) for the victims of the Holocaust. The municipality has an area of 644.934 km2, the municipal unit 385.386 km2. Komotini Industrial Zone (SE, 9 km (6 mi) from City centre), with dozens of factories and an environmentally friendly natural gas-fuelled power plant. Panepistimioupoli/Democritus University Campus (NW,3 km (2 mi) from City Centre) home of D.U.TH. The province of Komotini (Greek: Επαρχία Κομοτηνής) was one of the provinces of the Rhodope Prefecture. Its territory corresponded with that of the current municipalities Komotini and Iasmos, and the municipal units Maroneia and Organi. It was abolished in 2006. There are more than adequate primary and secondary education facilities in the city. There are around 20 primary schools, 7 gymnasia (junior high schools) and 4 lykeia (high schools) as well as the Institute for Vocational Training (IEK Komotini). In addition there is 2 technical education institutes (TEE). The Komotini campus has a dynamic population of approximately 5–10.000 students and a major part of social life evolves around it. The founding of the University of Thrace in 1973 has had a significant positive influence on the entire urban area fuelling the city's expansion and growth. The Police Academy is located 7 kilometres (4 miles) from Komotini on the road to Xanthi on extensive grounds and with modern facilities. The main television station based in Komotini is R Channel although other stations broadcast from the city, namely Delta from neighbouring Alexandroupoli and ET3 (the northern branch of the Hellenic Broadcasting Corporation) from Thessaloniki. There has been increasing activity in this sector for the last 50 years. There are now 7 daily and 2 weekly active newspapers in the city. Paratiritis tis Thrakis (Observer of Thrace): Multilingual (recognised with distinction by the President of The Hellenic Republic for its innovation) politics and culture. To Elefthero Vima (Free Standpoint): Politics and culture. Thrakiki Agora (Thracian Market): Weekly Politics and Financial news. I Foni tis Rodopis (Voice of Rodopi): Politics. Antifonitis (The Opposition): Reactionary Politics, satirical commentary. Thrakiki Gi (Thracian Land): Politics and Agricultural News. I Patrida (The Homeland): One of the oldest,Politics. All of the above are paper based. However, there is an increasing volume of news and content that is on the newspapers' websites. The latter can be accessed from the news section of Komotini's commercial portal. Komotini is a midland city and has no port. It is served by two airports. The nearest is in Alexandroupoli (65 km), and the other is in Kavala (80 km). European route E90 runs through the city and connects Komotini with the other Greek Continental cities. The Egnatia Motorway (A2) lies south of the city. One can enter the city from one of two Junctions; 'Komotini West' and 'Komotini East'. There are a number of municipal buses serving 3 main lines within the city. The Intercity Bus Company of Komotini connects it to many local villages, the coastal areas and major Greek cities. Hellenic Railways Organisation (OSE) trains run regularly at least twice daily westwards to Thessaloniki and Athens and eastwards to Evros and occasionally Istanbul. There is an impressive array of sports facilities available. They include the Komotini Municipal Stadium (Home of Panthrakikos FC), Panthrakiko Stadium (training grounds), Municipal Sports Complex (NE of the city), Municipal Swimming pool and Basketball Arena, Democritus University Sports Complex including an Arena and an Aquatic Centre as well as basketball courts in almost every school in the city. The mountainous area in the north of the city is ideal for mountain-biking and trekking as well as 4x4 racing both of which take place throughout the year. ^ a b "Visit Greece - ΚΟΜΟΤΗΝΗ". www.visitgreece.gr. ^ a b c d e f g h i Kiel 2004, p. 330. ^ Kiel, Machiel (1971). "Observations on the History of Northern Greece during the Turkish Rule: Historical and Architectural Description of the Turkish Monuments of Komotini and Serres, their place in the Development of Ottoman Turkish Architecture and their Present Condition". Balkan Studies. 12: 417. ^ Kiel 2004, pp. 329–330. ^ Kiel 2004, p. 331. ^ "Reviving high-rise blocks for cohesive and green neighbourhoods" (PDF). RE-Block: Baseline Study. European Regional Development Fund. p. 44. Archived from the original (PDF) on 22 October 2013. Retrieved 24 October 2013. ^ Book (in Hebrew):Bar-Zohar, Michael, The trains went out empty, Hed-Artzi, Or-Yhuda, Israel, 1999, page 86. ^ Book (in Greek): "Το Ολοκαύτωμα των Ελλήνων Εβραίων – Μνημεία και Μνήμες", Κεντρικό Ισραηλίτικο Συμβούλιο Ελλάδος, 1st Edition: January 2007, ISBN 978-960-86029-4-6, pages 51–56. ^ 15 March 2010 article in the Greek newspaper Παρατηρητής της Θράκης: "Το ζήτημα της ιστορίας των εβραίων της Κομοτηνής ξανά στην επικαιρότητα- Με το βιβλίο του Θρασύβουλου Ορ. Παπαστρατή «Από τη Γκιουμουλτζίνα στην Τρεμπλίνκα. Ιστορία των Εβραίων της Κομοτηνής»" Archived 21 July 2011 at the Wayback Machine. ^ 09 April 2010 article in Greek newspaper Παρατηρητής της Θράκης: "Η ιστορία του Σαμπετάι και της Νταίζη από την Κομοτηνή" του Βασίλη Ριτζαλέου Archived 21 July 2011 at the Wayback Machine. ^ "Komotini Online : Ειδήσεις και Νέα από τη Ροδόπη". www.kom.gr. Kiel, M. (2004). "Gümüld̲j̲ine". The Encyclopedia of Islam, New Edition, Volume XII: Supplement. Leiden and New York: BRILL. pp. 329–331. ISBN 978-90-04-13974-9. Wikivoyage has a travel guide for Komotini. Wikimedia Commons has media related to Komotini.